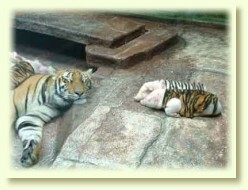 What happens when you put five cute, little innocent piglets into a tiger’s den? Most would guess that the tiger would be looking at its next meal. At a zoo in California, a tiger gave birth to three cubs. As this was a very rare event, everyone at the zoo was very excited. Unfortunately the excitement didn’t last long; the cubs were premature and died shortly after birth. Even though the zoo staff took very good care of the mother tiger, her health started deteriorating very quickly. At first, no one understood why she could not regain her vigor. But when they came to the realization that the mother was yearning for her lost babies, it occurred to them that they could simply replace her cubs! However, even after searching frantically, they were unable to find suitable replacements. Then they thought of another idea, which was to replace the cubs with babies from an entirely different species. So they found a litter of five orphaned piglets. It seemed like it could be a perfect match, but no one knew what the tiger’s reaction would be. Would she see them as prey, or accept them as her own? Then they were enlightened with the creative idea of wrapping the piglets in tiger skins before placing them in the den. 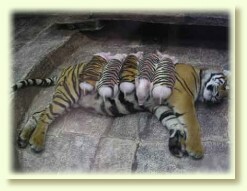 Everyone held their breath as they placed the unsuspecting piglets in with the mother tiger. But imagine the delight when instead of seeing them as dinner the tiger accepted them as her new baby cubs! 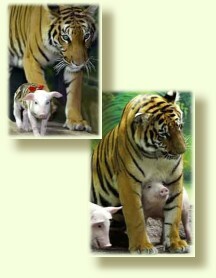 These little pigs now have a caring tiger mommy to look after them, and the mother tiger has a way to share her love.